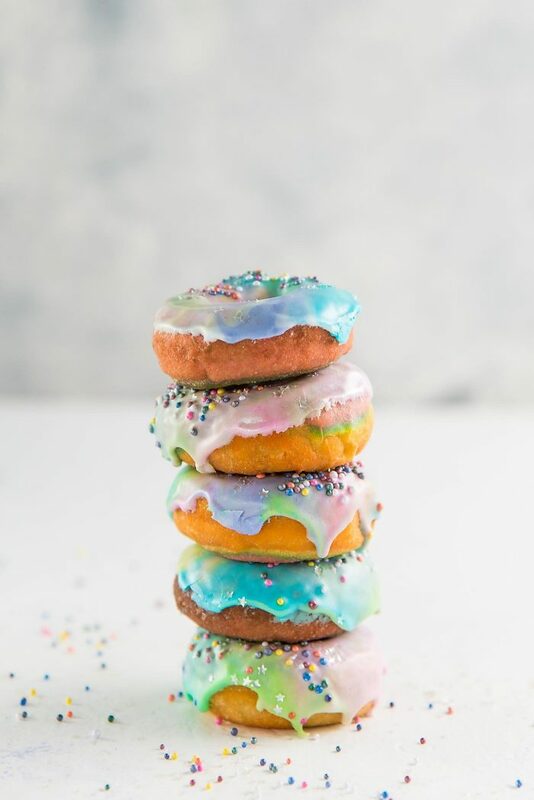 Soft, perfectly sweet with a hint of citrus flavor, these Mini Unicorn Rainbow Donuts are colorful and gorgeous inside and out, with a swirled rainbow colored dough and a colorful, rippled unicorn glaze, complete with stars and glitter. Perfect for fun kids’ parties, themed parties, entertaining, or to celebrate all the unicorns in your life! Do you love unicorns? I mean reeaaallly love unicorns? 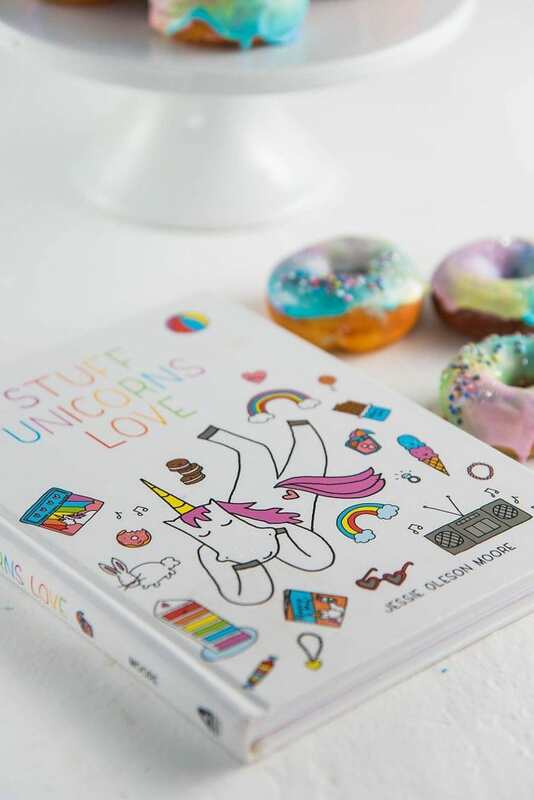 If your answer is yes, and you had always wanted to get the inside scoop on all things unicorn, then you’d want to get your hands on a copy of this magical, mystical, whimsical account of unicorns called Stuff Unicorns Love by Jessie Moore! Jessie is the blogger behind Cakespy.com, and I’ve been a huge fan of hers since even before the beginning of my own blog. I love her sweet creations, and that includes her recipes, her stories and all her gorgeous illustrations. So I was more than excited to get a copy of her book and be inspired by all things unicorn! If you follow my blog you already know how much I love making fun, magical stuff – like this magical color changing galaxy lemonade, galaxy ice cream, shimmery liqueurs and legit magical color changing cocktails! But after reading this book, I was inspired to add to that list with something unicorn. 🙂 And it had to be something that epitomized unicorns – like Mini Unicorn Rainbow Donuts! These mini unicorn rainbow donuts have everything that unicorns love. And of course DONUTS! check, check, check. 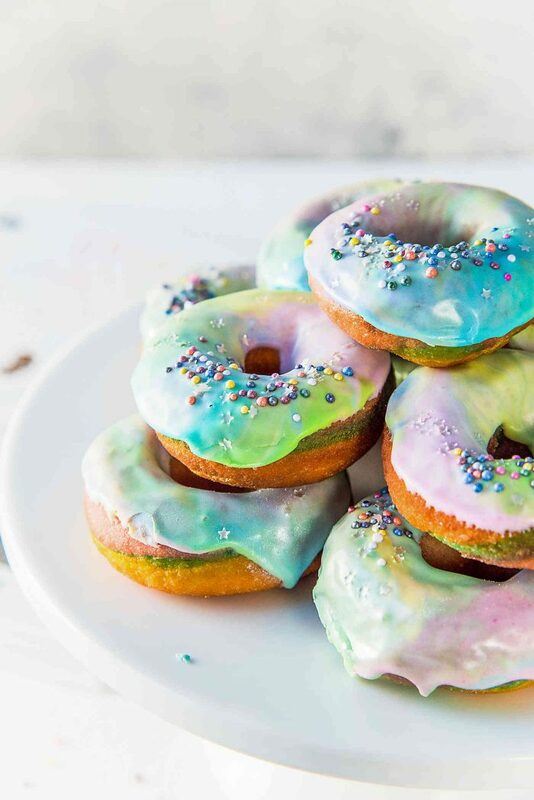 Soft, perfectly sweet, rainbow swirled fried donuts, topped with unicorn glaze, sprinkles and stars. 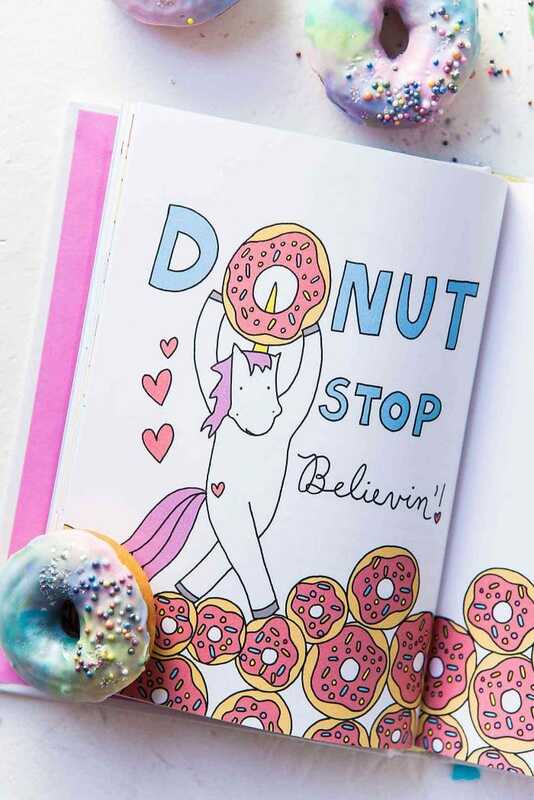 As the book reveals, there’s a reason why unicorn horns originally evolved as a donut-holding appendage. 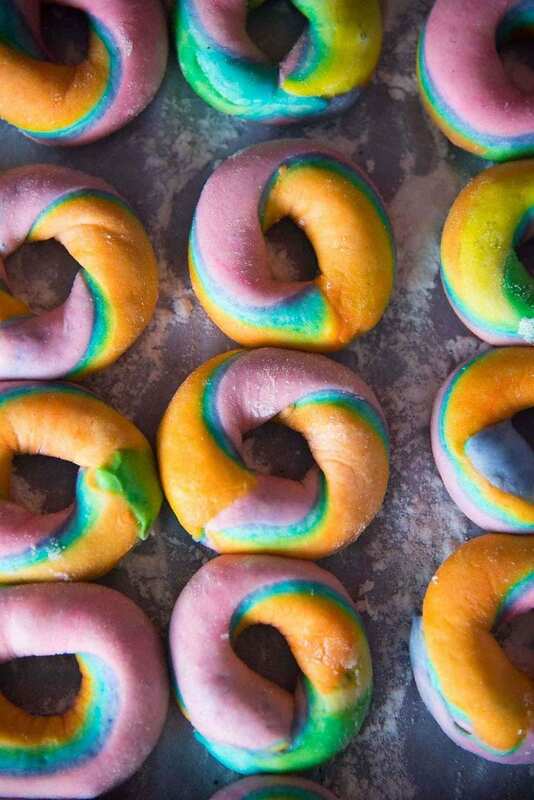 Even unicorns could never get enough of these scrumptious mini rainbow donuts. To make these mini rainbow donuts, I used the same donut recipe that I used for my regular donut troubleshooting post here. But instead of plain donuts, I added some citrus flavor here to brighten up the flavor profile AND I also colored them in rainbow colors too. These donuts are shaped differently compared to regular donuts as well. Instead of cutting out donuts using a circle cutter, I opted to shape these the same way you would shape bagels. So I cut strips of the donut dough, then twisted the strips so I could make swirled rainbow colored donuts. This also makes sure I use every bit of the donut dough, so there’s no leftover dough. That way you don’t have re-knead, re-rest and re-cut the dough (which would’ve messed up the rainbow colors too). 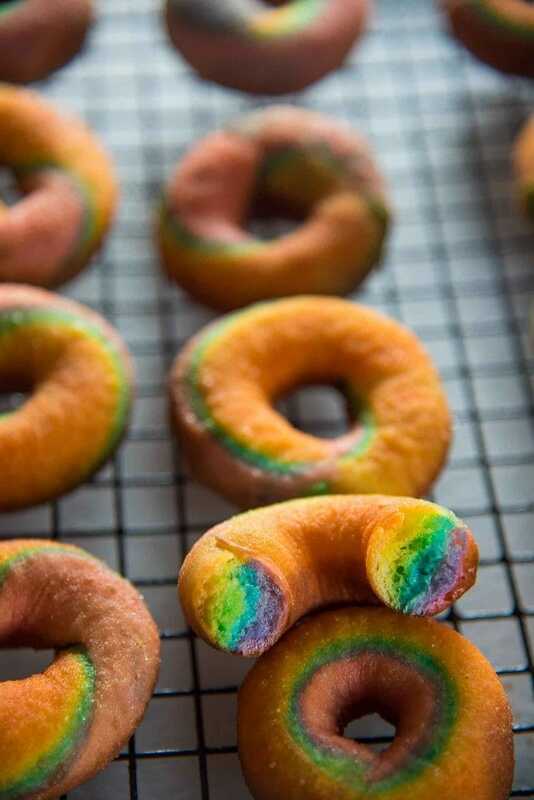 Here are some tips to help you make these beautiful mini rainbow donuts. 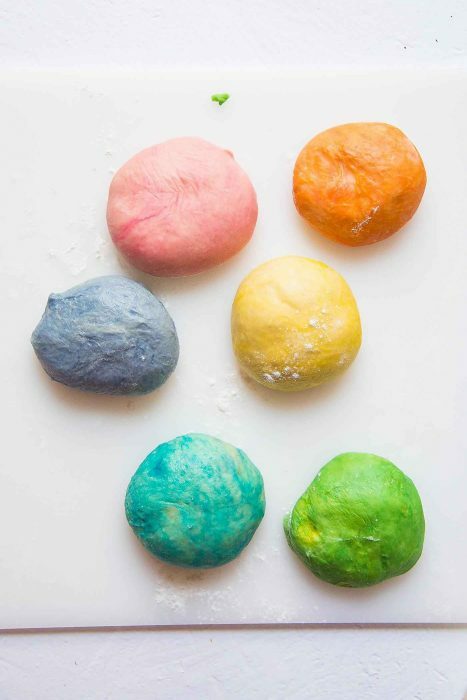 Color the dough after mixing and kneading it – it’s easier to portion the dough into 6, and then re-knead them separately with the colors you want. 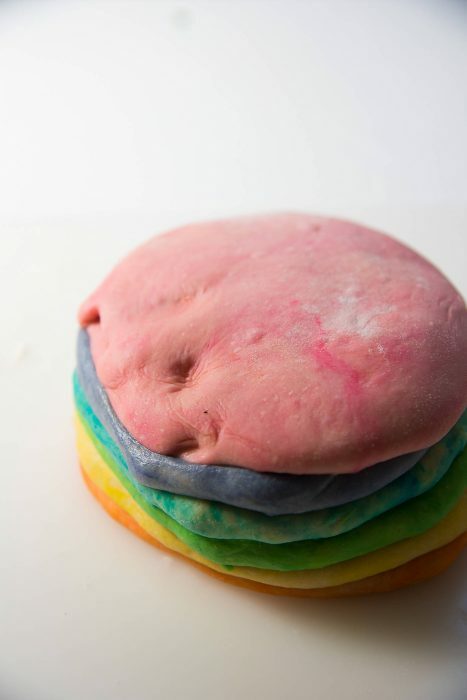 Stack the colored dough and allow the dough to rise overnight in the fridge (slow rise). Since the dough is soft, it’ll be more manageable when it’s cold. Plus you’re making sure all the colors will rise evenly and together. 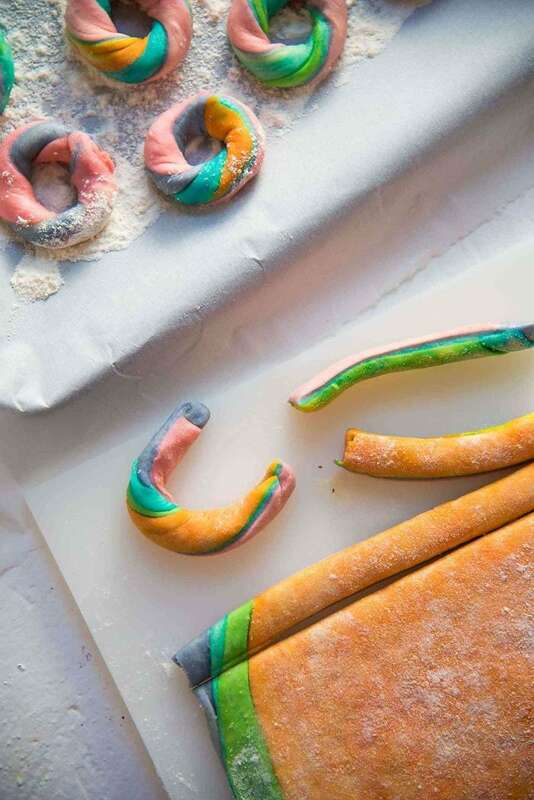 Cut thin strips (1 cm – 1.5 cm thick, 4 inches long) to make the donuts. Roll the strips lightly to get a smooth cylindrical shape. Dab water on the edges of the strip and then pinch the edges together to form a ring (donut-shaped). It’s important to pinch the edges together so that the ring/donut shape remains intact. You must allow the donuts to rise in a warm place for at least 30 minutes (45 minutes in a colder environment) before frying. This allows the donut seams to completely stick together, so that they don’t split open while frying. Once the donuts are fried, they are ready to be glazed. I made a unicorn colored glaze to go with the mini rainbow donuts. This glaze is thicker than the my usual donut glaze because it was important for me to be able to see the rippled colors of the glaze. 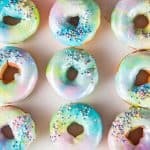 There are TWO ways that you can glaze these mini rainbow donuts to have that colorful, rippled unicorn glaze. 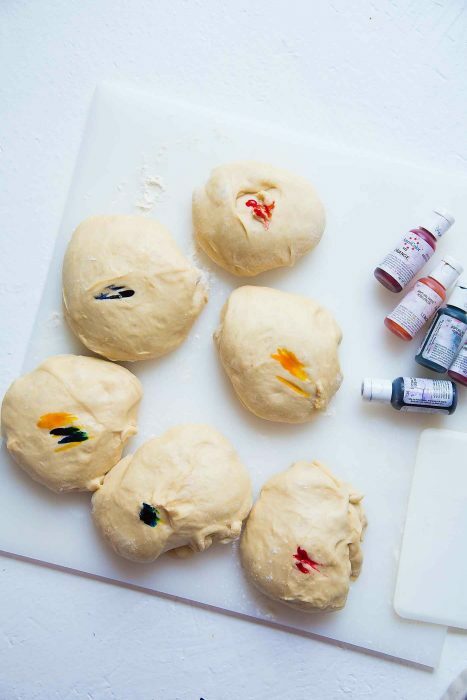 First method – place the colored glazes in separate pastry bags (or ziplock bags). 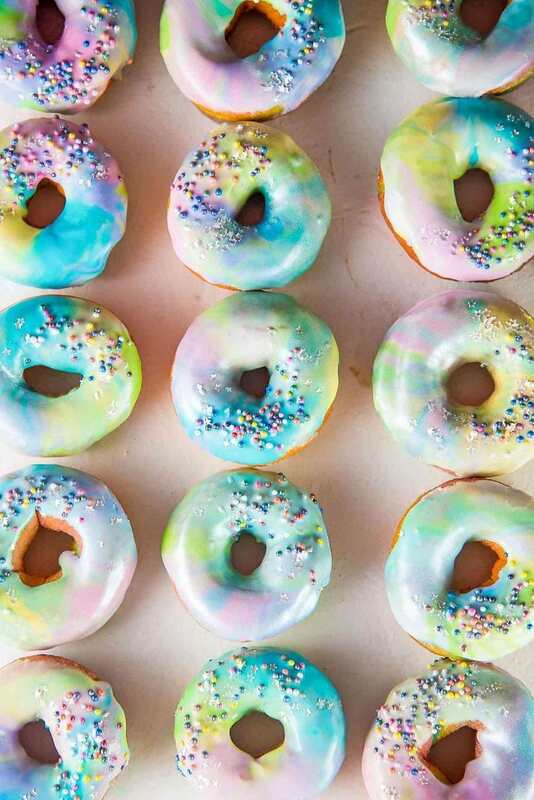 Cut a small hole in the bags (about 2 – 3 mm), and drizzle each color over the donuts to create a pattern on top, and allow the excess glaze to spread and drip off the sides. 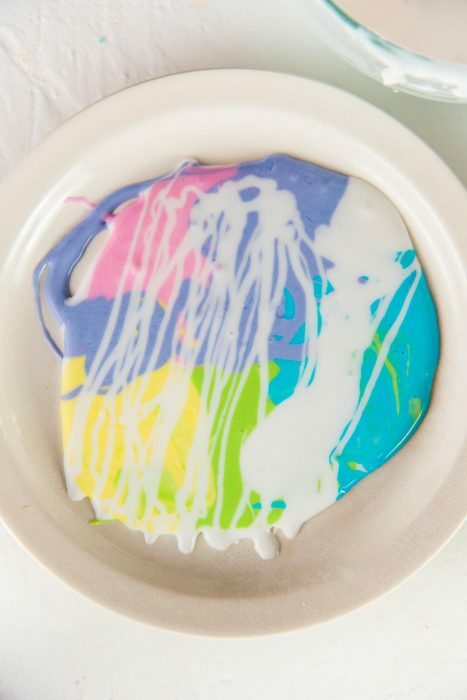 Second method – drizzle each of the colors into a shallow bowl or saucer, along with some of the white glaze as well. Dip the top of each donut in the rippled glaze, twist slightly and remove. Drizzle more color as needed until all the donuts are glazed. Both of these methods will results in a beautiful pastel rainbow like pattern on your mini unicorn donuts. And don’t forget the sprinkles. Make sure to get those rainbow sprinkles and stars on while the glaze is still soft. These mini unicorn donuts are incredibly delicious. With a hint of lemon in the donut as well as the glaze, it’s the perfect balance of sweetness and fruity freshness. And they are super fun when you bite into them to discover the gorgeous, swirled rainbow colors inside. 🙂 And yes, if you’re thinking about it, go ahead and plant a few of these mini donuts in your garden. You never know what you’ll discover the next morning. And get your hands on your own copy of Stuff Unicorns Love by Jessie Oleson Moore on Amazon by clicking here. Mini rainbow donuts with a unicorn glaze - Colorful and gorgeous, fried donuts made with rainbow colored dough and coated with a rippled unicorn glaze. Set aside about ¼ cup of the flour and place the rest in the mixing bowl with the sugar, milk, yeast mix, eggs, vanilla, lemon extract and salt (that excess flour you set aside is in case you need it later). Mix on low speed with the paddle attachment or kneading hook on your mixer, until the mix comes together. If you used the paddle mix, switch to the dough hook and start kneading the dough. Add the softened butter (1/2 - 1 tbsp at a time) until it's all incorporated. Add some flour, if you need to get the dough off the sides of the bowl. Add the rest of the flour if needed, to form a soft dough ball. Knead the dough for about 5 - 7 minutes until you have a soft, shiny, slightly tacky dough. Divide the dough into 6 portions. 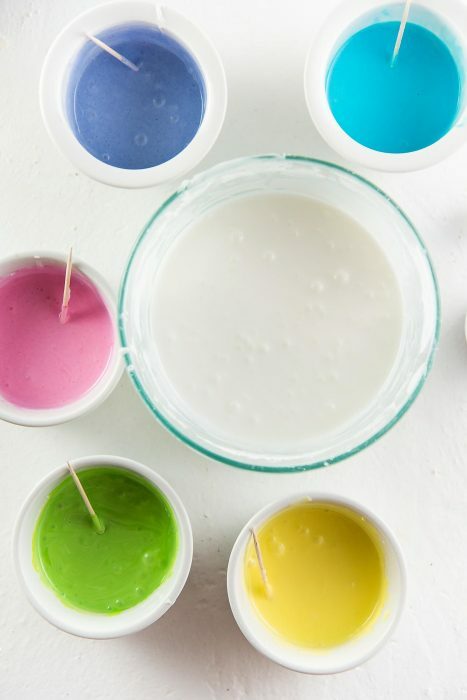 Color each portion with each of the food coloring (yellow, pink, orange, green, blue and purple). You can knead the color into the dough by hand OR use the mixer and knead the dough for 2 - 3 minute until the color mixes in. 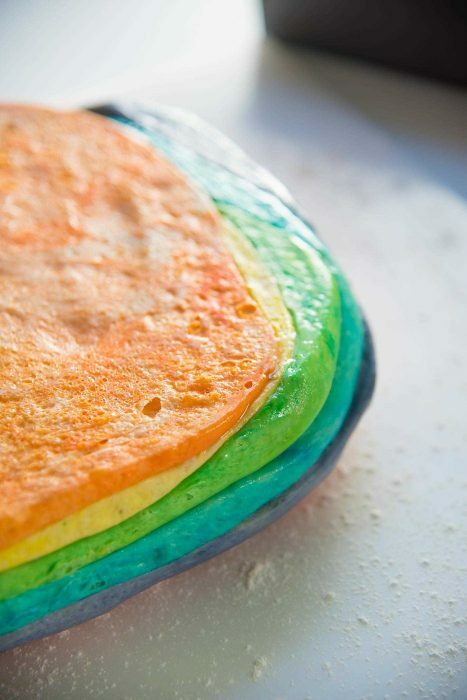 Flatten each piece of colored dough into a disc shape. Brush each disc lightly with water and layer them on top of each other. I layered them in this order - orange, yellow, green, blue, purple and pink. Place the layered dough discs on a lightly oiled cake tray (or a dish with a wide, flat bottom and sides). Cover with plastic wrap and refrigerate overnight, up to 24 hours (I skipped the room temperature rise for this recipe). Next morning, turn the dough out on to a floured surface and roll it out to a 1/4 inch thickness, making sure that all the layers are still in order. Keep the donut dough covered as you cut and shape the donuts. Cut 1 - 1.5 cm inch strips from the dough, and then cut each strip into pieces that are 4 inches in length. Gently roll the strip to form a smooth, round cylinder. Dab each end of the strip with a little water and bring them together to form a donut ring. You can choose to either twist the strip to create a swirled pattern or not. Pinch the edges of the strip together to make sure the ends stick together and the donut ring shape remains intact. Place the donuts on a baking tray lined with parchment paper with at least 1.5 inches between each. You may need to use TWO baking trays for all the donuts. Cover the shaped donuts with plastic wrap and leave them to rise in a warm place for 30 - 45 minutes. Heat at least 3 inches of oil or shortening (the donut needs to float at least 2 inches above the bottom of the pan) in a heavy bottomed pan. When the oil is heated to 375°F/190°C, carefully drop one donut. 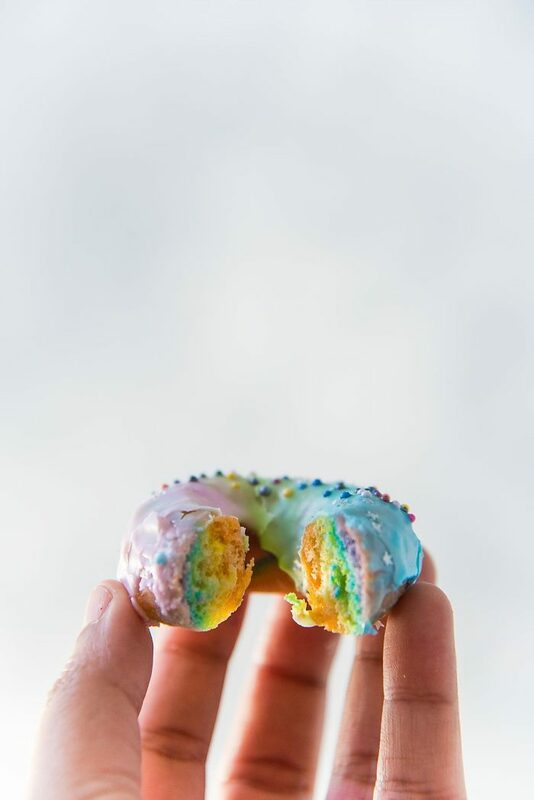 After 15 - 20 seconds the donut should have turned a light golden color, with the rainbow colors of the dough still fairly visible. Flip the donut to fry the other side for a further 15 - 20 seconds. Transfer the donut to a wire rack to cool down. Sift the icing sugar, then add lemon extract and whisk in the milk - 1 tbsp at a time, until you get a pourable, but thick consistency. Add a few drops of the white coloring to the base glaze. Divide the glaze into 7 portions. Color each portion with yellow, orange, pink, purple, blue, green, and keep the last one white. Use the white coloring if needed to get pastel colors for the glaze. In a shallow bowl, drizzle each of the pastel colors and top up with a drizzle of the white glaze. Dip the tops of each mini donut in the drizzled glaze, twist and remove. 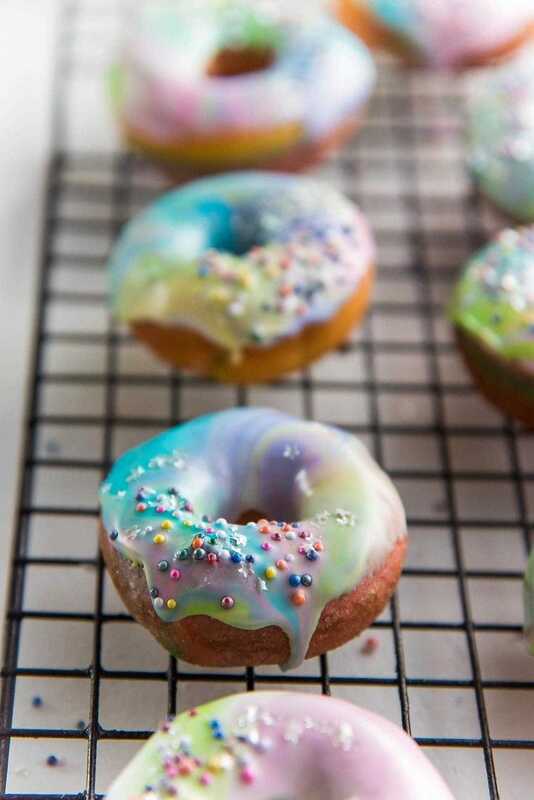 You should end up with a “tie dye” style donut frosting. Sprinkle rainbow sprinkles and stars on top while the glaze is still wet. 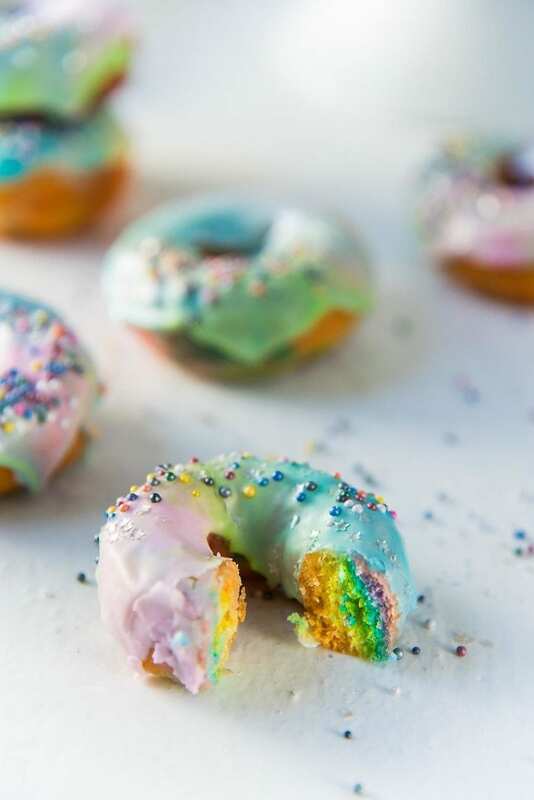 If you liked this mini rainbow donuts (mini unicorn rainbow donuts) recipe, don’t forget to subscribe for new (and free) recipes by entering your email address on the side bar (and get all these recipes delivered straight to your inbox), so you don’t miss out on a thing. You can find me on FACEBOOK, TWITTER,INSTAGRAM, PINTEREST, YOU TUBE and GOOGLE-PLUS too. These are seriously so gorgeous! How popular they would be at a party! I just can’t get over how cute these are! If I ever have a kid that wants a unicorn party I’m totally making these. Wow! Could these be any more beautiful? Count me in. These are downright magical! My kids would love these!